When driving south from Cancun on highway 307, the town of Limones is the last town you will come to before the Cafetal junction at which point you will turn to go to Majahual and Mayan Beach Garden. It is also a major bus stop where you can change from the MayaB bus system to the ADO busses. The town means "limes" in Spanish and for good reason. Years ago, the Mexican government wanted to find ways for people to make a living in less populated areas of Mexico. Recognizing a market for the export of limes, they gave parcels of lands to citizens along with grants to plant orchards of limes (part of the Ejido program). The town still grows lots of limes, but has added other produce as well, such as juice oranges, pineapples, melons and papaya. They also have started a growing business of selling nursery plants and furniture handmade from local woods. As you drive through Limones on 307, you might miss the ruin along the west side of the road. When driving South it will be on your left. It is a single pyramid that was restored around year 2000 but is already becoming overgrown. There is no fee to visit the small ruin. Services are limited in Limones. There is no gas station here. The closest gas station is in Majahual or Filipe Carrillo Puerto. Nevertheless, you can purchase gasoline in the town, just ask for "gasolina?" at the bus station or at the grocery store next to the Zocalo (pictured at right) and they will tell you where to get gas. Limones is my favorite place to purchase produce and Tortillas. There is a great tortilla shop in Limones and the "Topes" or speed bump vendors offer some of the best produce in the area, especially fruit. This quaint church is close to Limones Ruin. I've never see it open on weekdays. 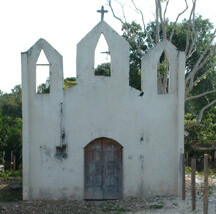 You will note that its style is not dissimilar from the church in Filipe Carrillo Puerto. Many of the inhabitants of Limones live in palapa roofed wooden huts with no running water. This is a very common way of living in rural areas of the Yucatan and is very similar to the way that rural Mayans lived centuries ago. Somehow, they still manage to have a TV!